Helena’s ghost is famous as the “Ghost of the Old Irish Linen Mill.” She died in the spring of 1912 in a tragic fall. There are many people who feel that her spirit haunts the linen mill where she worked. Today the employees at the printing company that is based out of this Belfast mill have reported many eerie and unusual encounters with Helena’s ghost. Helena Blunden was born in 1816 in Ireland, shortly after her family moved to England where she grew up. When she was 16 years old her family moved back to Ireland. They settled in a small house in the old market area of Belfast. Her uncles arranged for her to work at a linen mill near their new home. Helena was a hard-worker and had a cheerful personality. She quickly became popular among her mill co-workers. Helena loved to recite poetry and plays while working. She also was a very good dancer. Her favorite occupation was singing songs that were popular in London music halls at that time. Helena worked a 60-hour workweek, Monday through Saturday. She kept her spirits up with the thought that one day she would work as an entertainer upon the stage. He father encouraged her aspirations but her mother frowned upon her eldest daughter’s ambitions. Her fellow mill workers especially appreciated Helena’s talents because her efforts to entertain them by reciting, dancing, and singing broke up the monotony. The mill that Helena worked for was new and struggling so they went out of their way to impress. It was their double damask linen tablecloths that were used in the fancy first class dining room on the Titanic. The mill workers in order to finish special orders for their employers often worked on Sundays. It was on one such Sunday in April of 1912 that Helena was working to help finish a special order for Argentina. Helena was especially excited that Sunday for she was to attend a concert at the Grand Opera house that evening. In anticipation she sang while she worked. At 2:00 p.m. Helena realized that her work would not be done by 6:00 p.m. Concerned, she realized that there would not be much time between finishing her work and going to the concert. She kept her shoes on so she would be ready to leave as soon as her work was done. In April the mill’s temperature would start to rise. In the spinning room on the top floor where Helena worked the heat was often intolerable. This heat resulted in condensation forming on the walls and floors. An older mill worker, Margaret Maxwell, who could no longer do her usual work in the flax house, was assigned in the afternoons to wipe and mop the moisture off the mill's walls and stairs. Margaret was a tough woman who in her youth had brawled with both women and men in the street. Margaret defied anyone who dared to walk on her floors as she mopped. She frightened the younger workers in the mill and she had taken an immediate dislike to Helena’s optimism. She was often heard deriding Helena’s songs. The two women had clashed on more than one occasion. On that Sunday at 7:00 p.m. Helena finally finished her work and headed down the flight of stairs joyfully, she didn’t see the mop that Margaret had left on the steps. Margaret listened to Helena’s shriek and watched as she tripped and fell over the bannister and down to the ground floor. When Margaret approached Helena was dead. A printing company is housed in the mill’s pure Flax House today. One of the companies’ workers, Paul McAvoy, started to hear thumps, boxes moving, doors opening with no one entering, and footsteps on the building’s wooden floors. At first, McAvoy did not think much about it but then the ghost touched him. One Sunday morning as he ran the press he heard what he thought was a co-worker entering the pressroom. He didn't look up from his work until he felt someone tap him on his right shoulder four times. Startled he realized no one was in the room with him. Since, he has heard a female voice call his name, especially in the mill’s basement. When he and fellow workers investigate no one is there or outside. McAvoy feels the ghost is a woman because her voice is feminine and she walks softly on the mill’s wooden floors. He has stated that this ghost does not frighten him. Many feel this spirit is Helena Blunden. One eerie occurrence that happens on a regular basis involves the printing company's lights and radios. Each evening as the company is closed down for the day the lights and radios are all turned off but inevitably the next morning the lights are on and the radios are blaring as the first employee enters. The sightings of Helena's ghost are so frequent a web camera was placed in the building and left on for 24 hours, seven days a week, for over a year. During this time Helena’s apparition was spotted between eight to twelve times a month. One final note: a linen bundle was discovered by accident that contained a 100-year old recording with a newspaper review of Helena Blunden’s singing talent. The recording is Helena singing “Pie Jesu”, it was made in January of 1912 just three months before her tragic death. The Wendigo, sometimes spelled Windigo, is a favorite campfire ghost story. I first encountered it when reading Alvin Schwartz’s Scary Stories To Tell In The Dark. Schwartz's version is a shorter version than the story that was written by the horror writer Algernon Blackwood called “The Wendigo.” Blackwood didn’t originate the story. It was told for many years among the American Indians tribes that live in the Great Lakes region, specifically in Minnesota. The story of the Wendigo is also told in Canada. In Ontario near the town of Kenora, traders, trackers and trappers have spotted this creature for many decades. Many hunters and campers in the Northern Woods of Minnesota have also told tales of their encounters with this mysterious creature. The Algernon Blackwood version is considered by some to be the scariest version. The Schwartz version is a nice one to read if you are not familiar with this story. In this post I share a Native American version of the Wendigo, it is different than Blackwood’s and Schwartz's tales. According to Native American legend the Wendigo once was human but was magically transformed into a strange creature. The Wendigo is described as being a giant spirit or ghost standing over fifteen feet tall. It is often stated that it has glowing eyes, long yellow fanged teeth, a very long tongue, and matted hair. It is also said the Wendigo is driven by an insatiable hunger for human flesh. The legend states that the poor souls who have been turned into Wendigos are doomed to this form because they ate human flesh while alive in order to survive. In fact, some state that this legend is meant to be a cautionary tale warning against cannibalism. Over the years there have been a large number of sightings of this creature, which have resulted in the legend being kept alive. Early western settlers often reported seeing a “banshee-like” creature, they feared its appearance because they believed this meant that there was to be a death in their community. So the Wendigo to them was a harbinger. Rosesu, a small Northern Minnesota town reported sightings of the Wendigo near their community from the late 1900’s into the early 1920s and each time right after these sightings an unexpected death would occur. As recently as the last century, Native Americans still believed in the existence of the Wendigo. 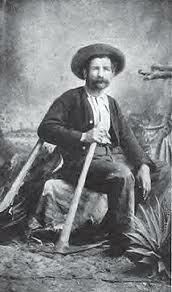 One Cree Indian, Jack Fiddler, stated that he had seen the creature many times in his lifetime. The beliefs that the Wendigo seeks human flesh, and that it is a portent of doom still persist today. Here is one Native American tale about the Windigo. It had been a long harsh winter with snowstorms that left behind large drifts. When the latest storm briefly broke a father sent his son to hunt for much needed food. The son keeping his spear and knife close looked for any trace of animal tracks in the snow. The forest was oddly quiet, gleaming with snow and ice. As the son moved through the trees he heard a strange hissing sound. It seemed to come from everywhere. He spotted blood-soaked footprints in the path in front of him. He sensed the Windigo was watching him. He knew about this creature because his father had described it to him as a child. It was as large as a tree, with a lipless mouth and jagged teeth. As it breathed it hissed. It had matted hair that was often covered in a long white robe. A star mark on its forehead. The creature's footprints always trailed blood. It was known to kill and eat any human that crossed its path. The son knew if he didn't prevail he would die. He backed away slowly from the hissing sound. He gripped his spear in one hand and his knife in the other. A snow bank next to him erupted as the creature leapt at him. He rolled quickly through the snow to one side, the white snow that now covered him concealed him from view. The Windigo whipped his massive frame around quickly looking for him. The son threw his spear striking the creature squarely in the chest. The Windigo grunted and easily shook the spear off. The son hid behind a small tree as the creature continued to search for him. The Windigo approached his hiding place. His sharp eyes spotted the boy's outline against the tree. The creature bent toward him, its long arms reaching out. The son taking his last chance raced forward and embraced the creature at the same time thrusting his knife deeply into the Windigo’s eye. It screamed in pain as the knife twisted deeper into his brain. The creature tried to pull the boy off his chest but the son stubbornly clung to him stabbing one eye and then the other again and again. The Windigo finally collapsed to the ground crushing the boy beneath him. The son pulled himself loose and stood staring down at the creature. Its form started to fade against the snow, only the blood pouring from its eyes and ears showing any contrast to the snow. The figure completely disappeared leaving just a pool of blood where it fell. The boy, shaken, tired and still terrified headed for home. The fates were with him because at the edge of the wood a fat red fox appeared. With a prayer of thanksgiving the son killed the fox and took it home to his starving family. This meat lasted for several days. When the last winter storm had come and gone the son could once again hunt for food. Long before the idea of Santa Claus was imported to Norway by department stores that wanted to increase their year-end sales, Christmas in Norwegian folk tradition was a time associated with ghosts. Norwegians believed the ghosts of their ancestors returned to their earthly homes in midwinter. Until the late 19th century straw was left in many homes for these invisible “guests” to sleep on during the holiday season, bread was left out as well for them to eat. In a popular fairy tale a family was regularly chased out of their home by a horde of invading Christmas ghosts. The ghosts were finally gotten rid of when a white bear outwitted them, the ghosts then left never to return. This folk tradition was so strong within the Norwegian culture at Christmas that even the Reformation could not dispose of it—even though the Lutherans tried. This Christmas tradition was so solidly embedded within the Norwegian belief system that many Norwegians viewed Christmas with a sense of dread. The belief that ghosts and other normally hidden beings returned at Christmas scared so many that it drove many Norwegians to seek comfort in each other’s company on Christmas Eve. They would band together and share a bed of straw on a farmhouse floor. Even though the Reformation failed to change this Christmas belief, the passage of years did. Norwegian apprehension finally subsided but the telling of ghost stories remained a favorite at Christmas, not only in Norway but in many other parts of the Christian world as well—including colonial and frontier America. 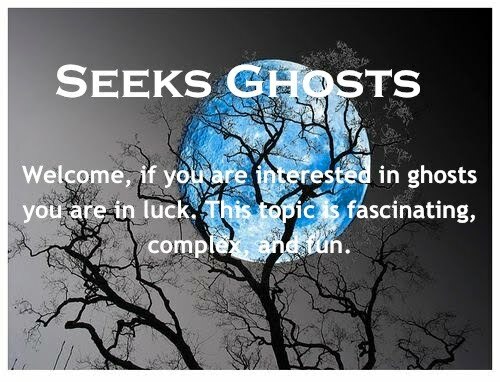 The Norwegian folk tradition, of welcoming returning ghosts into the home, lasted from the early Vikings until the industrial age in the early 1900s. The tradition of providing a comfortable straw bed for these ancestral spirits arose with the belief that if these ghosts were not kept happy they might take action against the homeowner. The straw that was used for these beds took on such magical qualities that it was not thrown out after Christmas. Instead it often was spread in the fields to improve the upcoming harvest or given to sick cattle as medicine. It was also woven into ornamental crosses. In Norway today what remains of this folk tradition is decorating with straw ornaments at Christmastime. In particular, a mobile or crown is made out of several rings of straw, many diamond or angel shaped ornaments are hung from this. These are made from Yule straw, which is a throwback to the straw that each family laid out for their ghostly visitors. The tale of the Flying Dutchman has been told for 100s of years. The phantom vessel in this story is always seen during stormy weather off the Cape of Good Hope or in the North Sea. The term “Flying Dutchman” actually refers to the captain not the ship he sails. There are many versions of his story. The two told most often follow. One legend states that a very stubborn Dutch sea captain was struggling to round the Cape of Good Hope. He had fought a strong head wind all day, when other vessels asked if he would take refuge in the bay he laughed and shook his fist at the wind and swore he would not give up. His crew pleaded with him to head to safety but the captain appearing to be mad refused to change course. The captain broke into obscene songs, before heading below to his cabin to drink beer and smoke his pipe. Monstrous waves pummeled the sides of the ship, howling winds bent the masts and tore the sails, but still the captain held his course. To the crew’s horror he even challenged the wrath of God by swearing a blasphemous oath. His men feeling the captain was surely mad, mutinied. But the drunken captain was awakened by the clamor and shot and killed the leader of the rebellion. He threw his body overboard. The figure didn’t move. Drawing his pistol, the captain tried to fire but the gun exploded in his hand. The second maritime version of this story always leaves out a lot of details. Again, the captain has been fighting the storm all day and refuses to take refuge in port. In this version he makes a rash bet with the devil for his soul that he can make it around the cape. He loses the bet and is doomed to sail for all eternity. In sightings, the captain is described as being alone on the ship; he is often described as being slumped over, as if he carries the weight of the world on his back. Witnesses have even reported seeing him place the initial bet with the devil, by rolling the dice over and over. He is heard pleading for mercy. In both versions the the captain and his ship become the classic harbinger. It is always stated that those seamen who encounter him are cursed or doomed. Each version of the Flying Dutchman has him named differently: Van der Decken, Fokkeis, Van Demien, and Van Straaten etc. For centuries the Flying Dutchman has been seen by witnesses piloting his spectral ship, it is most often spotted during violent wind storms. Some reports state the captain and his ship have led other ships astray, onto rocky shoals and hidden reefs. It is believed sightings of this phantom turns other ships' food supplies sour. This warning is always given-- even though this ship looks innocent other vessels should not draw alongside. The reason for this is if other ships accept letters to be delivered and these letters are opened by the living their ship’s will then flounder. Witnesses who have reported seeing the captain describe him as bareheaded, and clasping the wheel on the quarterdeck. He is always heard pleading to the heavens for mercy. Other witnesses have described in detail a crew of skeletons in the rigging, grinning miserably as they put on more sail. A recent reported sighting of the Flying Dutchman's ship was by a German submarine boat during World War ll. Yet another sighting occurred in 1835. A British ship spotted the phantom sails approaching them during a violent storm. The ship came so close that the British crew feared they might collide with the ghostly vessel but it vanished suddenly. In July of 1881, the Royal Navy ship H.M.S. Bacchante was rounding the tip of Africa, when they spotted the Flying Dutchman's ship. A young midshipman, a prince who later became King George V, recorded that a lookout and officer of the watch both had seen the eerie vessel. The lookout succumbed to the curse for he fell from the mast and died. As recently as March of 1939 the Flying Dutchman's ship was seen by dozens of sunbathers off the coast of South Africa. The last recorded sighting of the this ghostly vessel was in 1942 off the coast of Cape Town. Four witnesses saw the ship sail into Table Bay and then disappear. In 1825 Hugh Jones discovered a faint green line of copper ore in the Mule Mountains in southern Arizona. He was looking for silver so he ignored this strain and went on. What Jones didn’t know was that he had stumbled upon the richest pocket of copper in the world. In the late 1870s a civilian scout by the name of Jack Dunn was on a scouting mission with the U.S. Calvary. He and this troop were camped for the night near a spring in the Mule Mountains. While taking a walk after eating Dunn picked up several interesting rocks near what is today Castle Rock. Too busy at the time to do anything about it Dunn later filed a claim and confided his find to George Warren, a prospector. The two men became partners agreeing Warren would search the area for more claims. Warren on his way stopped to visit friends, he got drunk and revealed Dunn’s discovery. When Dunn checked back later he found that Warren had betrayed him, he and several other men where already working in the area. When Dunn discovered that Warren had filed additional claims and left him out of the deal, he sold his claim for $4,000 and left the area. George Warren later bet one of his claims on a foot race, which he lost. This claim eventually became known as the “Copper Queen,” which over the years produced millions of dollars in copper ore. Ironically, Warren is cited as the “founder” of the mining industry in the Mule Mountains—Dunn’s part is lost to history. Warren’s image is on Arizona’s state seal. As more claims were staked, several mining camps in the Mule Mountains were established, two of these were Mule Gulch and Brewery Gulch. 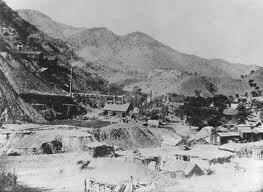 These camps nestled amidst the mountains were later incorporated into the town of Bisbee, Arizona. By the 1880s investors were sought for the area, one of these was Judge Dewitt Bisbee who purchased the Copper Queen Mine. The town of Bisbee was named after him. The judge lived in San Francisco and ironically never visited his namesake. Phelps Dodge Corporation became a dominant force among the investors and eventually took over the entire operation under the name Copper Queen Consolidated Mining Company. The Queen Mine was mined for almost 100 years, by the time it closed down in 1975 the medals it produced were valued at $6.1 million dollars. Besides 8 billion pounds of copper the mine also produced 2.8 million ounces of gold, 77 million pounds of silver, 30 million pounds of lead, and 371 million pounds of zinc. While in production the Queen Mine attracted a melting pot of immigrant miners from around world. These men labored beneath the Mule Mountains to feed the endless demand for copper and electricity. Bisbee’s Evergreen Cemetery reflects this human history. Italians, Hispanics, Serbs, Welsh, Irish, and Cornish miners all came to Bisbee looking for opportunity. In contrast, Brewery Gulch one of the adjoining mining camps mentioned above had 47 saloons and its fair share of “shady ladies.” It was considered the liveliest spot between El Paso and San Francisco. In 1951 the Lavender Pit was opened. It is named after the Mine Manager at the time, Harrison Lavender not the lavender colored hues that reflect off its walls. 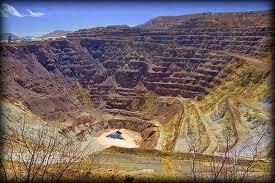 It was the first open pit mine in Arizona and was developed to increase yield. In this pit was found some of the finest pieces of turquoise in the southwest. This by-product of the mine was for years carried out casually in the miners’ lunchboxes. This turquoise is much sought after today because of its extreme blue color, hardness, and rarity--since the pit closed in 1974. Today, underneath Bisbee and the Mule Mountains there are over 1500 miles of tunnels and shafts. 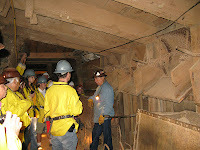 Wonderful underground tours are offered. 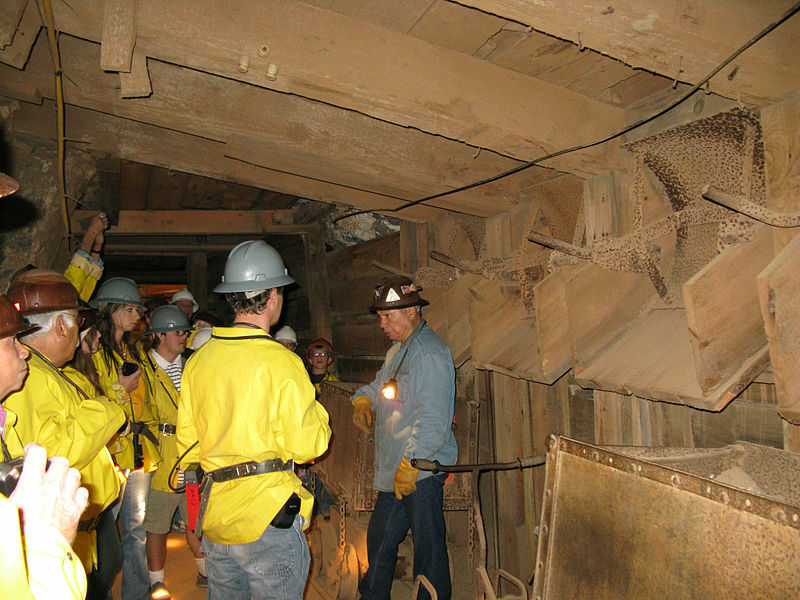 Guests don yellow slickers and miner hard hats and are escorted by guides who were once miners in the Copper Queen. Bisbee is considered to be very haunted. Two hotels in particular have interesting resident ghosts. Along the Tombstone Canyon Road there is a natural landmark towering over the road. It is a limestone formation known as Castle Rock. In October of 1935, Mrs. Mabel Watters, age 34, was walking home alone. Attired in her favorite black dress she strolled along the sidewalk along Tombstone Canyon Road. It was a quiet Sunday afternoon at 4:00 p.m., across the street from where Mrs. Mabel walked was a large boarding house--today this boarding house is The Inn at Castle Rock. As Mrs. Mabel passed, Norman Duke was sitting at one of the boarding house windows cleaning his gun, the gun accidentally discharged and a stray bullet shot across the street striking Mrs. Mabel in the back of the neck near her ear. Witnesses said she took a few steps and then fell over backwards onto the sidewalk. She died instantly. This incident was declared an accident officially. Ever since visitors to Bisbee have reported feeling a presence of a young woman as they walk past Castle Rock. Guests at The Inn of Castle Rock have witnessed a ghost of a women going from room to room searching for something. Over the years people have speculated that this is Mabel looking for her murderer. Limestone is known to help spirits manifest—it also retains memories that can cause residual hauntings. Another haunted location in Bisbee is the Copper Queen Hotel. It was built between 1898 and 1902 in the Italian style. In order to build it a side of the mountain had to be blasted away. The Phelps Dodge Corporation wanted a place where dignitaries and investors could relax in luxury. In its time the Copper Queen was considered the most modern hotel in the west. There are 3 ghosts that reside at the Copper Queen. The first is of a gentleman who has long hair and a beard. He is always seen wearing a black cape and a top hat. Several witnesses have smelled the aroma of his cigar just before they see him or right after. He most often appears in doorways or as a shadow in some of the rooms located on the fourth floor near the Teddy Roosevelt Room. The second ghost is probably the most famous. In life she was Julia Lowell. She is described as being in her early thirties; she was a lady of the evening from Brewery Gulch who often entertained her clients in the rooms at the Copper Queen. It is said that she fell madly in love with one of these clients but when she told him he no longer wanted anything to do with her. Julia then took her own life at the hotel. Her presence is felt on the west side of the building on the second and third floors. Some male guests have reported that they hear a female voice whispering in their ear. At other times she is seen in rooms dancing provocatively. She is seen most often at the foot of guests’ beds. Several witnesses have reported that she seemed to enjoy playing with their feet. Yet other witnesses have seen a white wispy smoke they feel is Julia. The third ghost is that of a young boy aged eight or nine. It is said he hangs out at the hotel because one of his parents worked there. He drowned in the nearby San Pedro River. He is by far the most mischievous of the three ghosts. Guests who have stayed on the west side of the hotel on the second and third floors report encounters with him. He startles guests because he likes to move objects from one table to the next. Many guests have heard footsteps running through the halls. They also report hearing him giggle. Unlike the other two ghosts no one ever sees this boy they only hear him.